Evidence has been accumulating for the impact of normal variation in caregiving quality on brain morphology in children, but the question remains whether differences in brain volume related to early caregiving translate to behavioral implications. In this longitudinal population-based study (N = 162), moderated mediation was tested for the relation between parental sensitivity and child prosocial behavior via brain volume, in boys and girls. Both maternal and paternal sensitivity were repeatedly observed between 1 and 4 years of age. Brain volume was assessed using magnetic resonance imaging measurements at age 8, and self-reported prosocial behavior of children was assessed at 9 years of age. Parental sensitivity was positively related to child brain volume, and to child prosocial behavior at trend level. Child brain volume was negatively related to child prosocial behavior. A significant gender-by-brain interaction was found, illustrating that daughters of sensitive parents were more prosocial and that less prosocial behavior was reported for girls with a larger total brain volume. 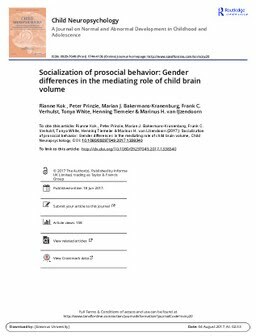 Child gender significantly moderated the indirect effect of parental sensitivity on prosocial behavior via total brain volume. A significant indirect pathway was found only in girls. The results warrant replication but indicate the importance of considering gender when studying the behavioral implications of differences in brain volume related to early caregiving experiences.